Arts and Adventure Paddlesports at BrassWind Landing. What sort of kayaking do you enjoy? Northern Michigan has one of the fastest rivers in the lower peninsula; the Sturgeon River. It actually sports some white water, fun drops, fast currents and exciting turns through the cedar trees. For a more relaxing trip the Indian River winds its way from Burt Lake beach by cottages, homes and restaurants out past I75 to a beautiful reed beds and wildlife area. 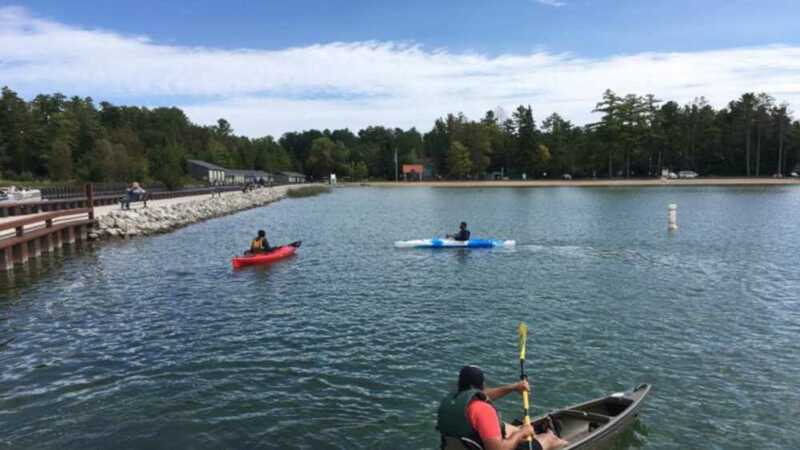 We also offer kayak, canoe and paddleboard rentals for Burt Lake, Mullett Lake and Indian River to your cottage or cabin. BrassWind BoatWorks offers workshops on building and restoring tape seam wood boats. In the Arts and Adventure Paddlesports Showroom we have made in the United States Liquid Logic Kayaks, Michigan Made Peregrine Sea Kayaks and North American Made Paluski Kayaks along with Stohlquist life jackets, seals accessories, Bending Branches and Aquabound paddles. BrassWind Landing is located downtown in the pedestrian friendly Village of Indian River where the water is never more than a couple blocks away. The BrassWind Landing building is nestled alongside a native Michigan wetlands and features a rain garden and is landscaped with large glacier ledgestone. We are just around the corner from the Drost's Ice Cream, Fudge and Chocolate shop. What more could one ask for? Well, you could ask about overnight paddling trips, guided trips and kayaking lessons.